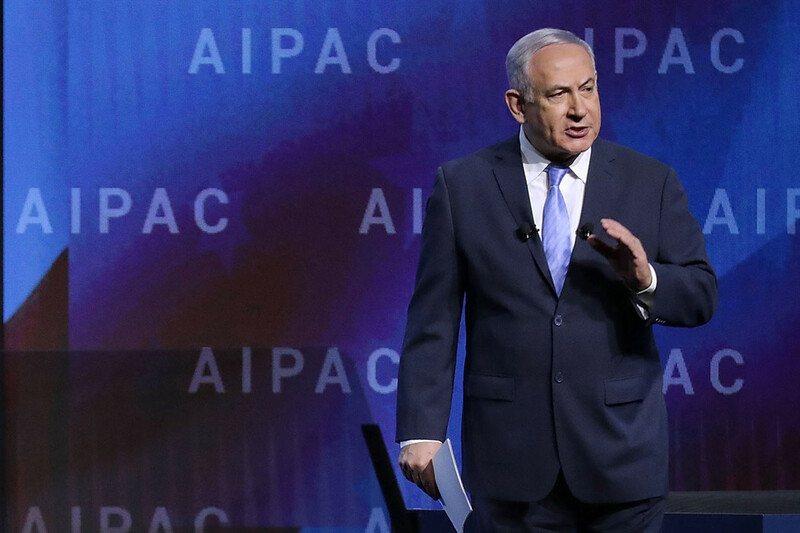 This year’s three-day AIPAC forum will include appearances by Netanyahu and his political rival, Benny Gantz. It also will feature speeches from Vice President Mike Pence, House Speaker Nancy Pelosi (D-Calif.), Senate Minority Leader Chuck Schumer (D-N.Y.), House Minority Leader Kevin McCarthy (R-Calif.) and an array of other lawmakers from both parties. The annual gathering comes at an extraordinarily turbulent moment in U.S.-Israel relations. Unconditional support for Israel was once sacrosanct in American politics, a topic so touchy that a mere misstep or slight flub could damage a politician’s career. But with Netanyahu making a critical election-season trip to the United States, Israel has become a partisan football, with Trump’s Republican Party on one side, and a new generation of Democrats, including the first Palestinian-American woman in Congress, on the other. Under Trump, the GOP has moved in lockstep with Israel and Netanyahu. Just on Thursday, Trump recognized Israeli control over the Golan Heights, a provocative move that no other U.S. president would even dream of doing during the past 50-plus years. The White House has signaled for weeks that the announcement was coming, but it was still seen as a major boost for Netanyahu, who gushed that Trump “is the greatest friend Israel ever had in our entire history” as he stood next to Secretary of State Mike Pompeo at a news conference in Jerusalem. Netanyahu will join Trump at the White House next Monday and Tuesday. It’s the Israeli prime minister’s second visit to the White House since Trump took office. The two leaders are scheduled to meet on Monday to “discuss their countries’ shared interests and actions in the Middle East.” On Tuesday, Trump will host Netanyahu for dinner, according to the White House. The Israeli elections are scheduled for April 9, with Netanyahu and Gantz — a former general and Israeli army chief of staff — locked in a tight contest. Trump, meanwhile, has also seized on anti-Semitic comments by Rep. Ilhan Omar (D-Minn.) to claim “Democrats hate Jewish people,” a raw partisan comment that outraged Democrats. Pompeo even singled out Omar by name during a Thursday interview on the Christian Broadcasting Network, an extraordinary move by an American diplomat engaged in official business overseas. “The rise of anti-Semitism in the United States and in Europe and in, frankly, all across the world is something that is deeply troubling, and to see someone — a duly elected congressman — behave in that way, to speak about anti-Semitism in that way, is of great concern,” Pompeo said. And Trump is pushing the so-called Jexodus movement, which is aimed at persuading Jewish Democrats to switch parties. “The ‘Jexodus’ movement encourages Jewish people to leave the Democrat Party. Total disrespect! Republicans are waiting with open arms,” Trump tweeted just last week. There’s no sign that the effort has had any success — surveys show Jewish voters remain overwhelmingly Democratic — but Trump’s efforts are clearly aimed at helping his own reelection effort next year. Democrats, for their part, are wrestling with the question over U.S. relations with Israel, a dispute that crosses the lines of race, religion and age. Newly elected Democratic lawmakers such as Omar and Rashida Tlaib of Michigan — the first two Muslim women elected to Congress — have bashed Israel’s harsh treatment of Palestinians. Omar’s criticism of AIPAC and the support Jewish-American voters have for Israel touched off a national furor over anti-Semitism. Omar later apologized for some of those remarks. The House also has twice passed resolutions condemning such comments, yet the controversy over Omar continues to reverberate inside the party. And while numerous Democratic lawmakers will speak at the three-day AIPAC forum, not one top-tier Democratic presidential candidate will be in attendance. In fact, Democratic front-runners — including Kamala Harris, Beto O’Rourke, Elizabeth Warren and Bernie Sanders — had no problem highlighting the fact that they would be skipping the gathering. New York City Mayor Bill de Blasio, who is weighing a presidential bid, will speak at the event. But a large bloc of other Democrats remain unquestionably aligned with Israel, despite their queasiness with Netanyahu’s tenure. These Democrats have raised concerns about the tenor of Israel criticism among Democrats, including Omar, both in public and private. In a statement to POLITICO on Thursday, House Foreign Affairs Committee Chairman Eliot Engel (D-N.Y.) signaled that he backed Trump’s announcement on the Golan Heights. A pair of Jewish Democrats also are pushing a new measure to condemn an international boycott campaign aimed at Israel — the “Boycott, Divestment and Sanctions” movement — a chance for much of the party to unify around support for the key U.S. ally after weeks of turmoil on the issue. House Judiciary Committee Chairman Jerry Nadler (D-N.Y.) and Rep. Brad Schneider (D-Ill.) introduced a resolution Thursday that denounces BDS efforts as “incompatible” with the official U.S. stance on a two-state solution to end the long-running Israeli-Palestinian conflict. “Its goal is Israel’s elimination, not the criticism of any particular policy of Israel,” they wrote of BDS, which has been cheered by some outside progressive groups as the best tool to force a change in Israeli treatment of Palestinians. The language on a two-state solution — which both parties have stuck by for years — is expected to be widely supported in the House. The resolution includes two GOP cosponsors: Reps. Lee Zeldin of New York and Ann Wagner of Missouri. Yet it could also expose a leftward shift among Democrats, with new members like Omar and Tlaib supporting such boycotts.